If I had to pick one thing that made for "good" painting, I'd say it was consistency across the model, unit, army or however many models there may be. 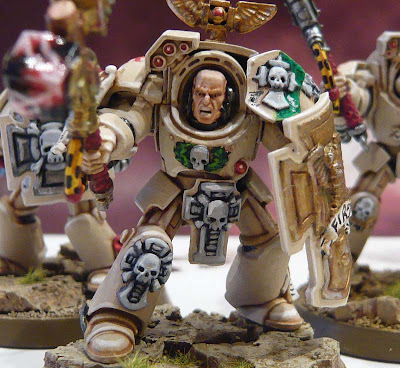 It wouldn't be the freehand or weathering powders or any of the fancy tips and tricks you can do, it would be that the same amount of careful attention has been deliberately applied to all of the models whether they be the biggest HQ or the smallest troop. After talking with a couple of faithful readers by email, they were kind enough to share their work with me and allow me to post some of their stuff here for the purpose of our discussion on consistency. Sharing their stuff and looking at it critically is in no way saying that these models are bad. Quite the contrary actually. These are some great looking models that with the help of a few minor adjustments, will look even better. So let's look at one of the examples. This Chaplain comes from the same force as the Deathwing terminator seen at the top of the post. As individual models, they both look great. Put together in an army, they work against each other in terms of painting. If you go back and look at the terminator at the top of the post, look carefully at his highlights. They are nice and subtle. They don't jump out screaming at you and they do a perfectly fine job of helping define the edges of the armour plates. Skip back down to the Chaplain now. Look at his highlights. High contrast, in your face and bold. That's not bad by any stretch of the imagination, it just doesn't match up in terms of consistency with the other models in the force. The terminators have subdued highlights and the Chaplain has high contrast. 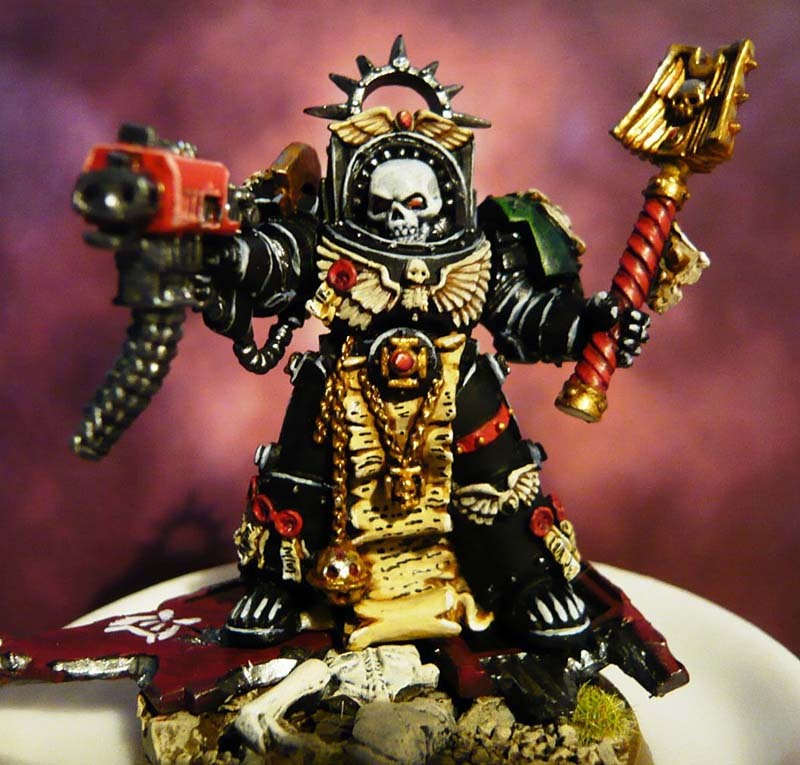 I suspect it was easier to achieve the high contrast on the Chaplain due to starting with black and being able to work up, but keeping it subdued like the terminators are will bring him in line visually with the rest of the force. He'll still stand out from them, but he will also be part of them because of the consistency in the application of subtle highlights across all the models. You can go bold or you can keep it subtle. Just keep it the same for everyone. Our next example is similar but on a smaller scale. I believe this guy may still be a bit of a WIP, but I'm going to use him to make the point. Look at his blue-grey armour. Gorgeous highlight effect. Multiple layers built up on each other to a higher than normal contrast. Very stylized. Now look at his helmet or his chest eagle or the plasma coils on his gun. They don't match the armour, They don't have the same stylized treatment the armour has. This can be a big time consumer when it comes to painting. You find a wonderful way to paint one portion of a model (and you're often very good at it) so you decide to do that to your model. Then you realize the amount of work that is going to take when expanded to a squad of ten models or a dreadnought or land raider. Combine that with the fact that you may not know exactly how to apply your cool technique to other parts of a model like the metallic portions and you run into even more problems. Like I mentioned, this model is a WIP and those issues will be taken care of I'm sure. It pays to do a test model or two and think about how you are going to apply your killer highlighting effect to all the areas of your model and then to all the different kinds of models in your army. Can you imagine trying this effect on a Land Raider? The result would be absolutely stunning, but line highlighting it three or four times over is going to take a little bit of time. In the end, it comes down to consistency. Make sure you have it on all parts of your model and then across your force. Doing that one thing will make your army look much better than any one gimmick you could add here or there. It's like basing, it's often the very simple things that make the biggest difference. I'd like to say a huge thanks to the guys who allowed me to share their work in this post once again so that we could look at it critically and learn something from their efforts. 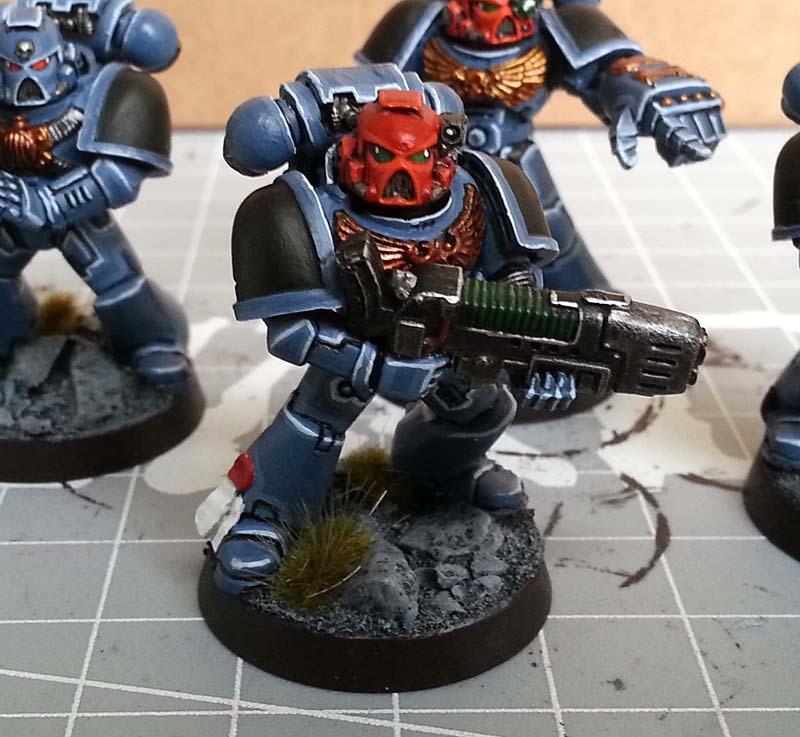 Painting your models, do you love to or hate to? Thank you for another lesson. I have this as a lessons learned archived. Still trying on test models to get the desired effect. I'm a starter painter and i come accros other small problems when i'm painting. Lol this keeps me motivated. Thank you once again for youre tips and i'm proud to see my WIP on your blog. I find I have huge problems getting consistency across different scale units - I've worked out you need different techniques on say, a Rhino compared to a Marine, but getting a consistant look with those different techniques is still a headache. I always seem to end up painting with a finished model stuck on the desk next to what i'm working on to try and keep the finish looking about right. having just switched paint brand isn't helping either, but thats a different story! dancing platypuss: Absolutely. Consistency across the board with all of your techniques. D.W.G. Wals: They are nice models and I appreciate you letting me use them to illustrate the point. Matt Farr: I do the same thing. I almost always have my test model or a finished one nearby to use as reference when painting other units in the same force. That's actually a really good idea. Experience helps a lot too with consistency and so does keeping a record of what colors and techniques you used if you are taking long breaks between sessions. I used to do a lot of test models and now (after decades) I can just look at the various bottles and cherry pick what colors I think will work with what I am try to achieve. It sometimes takes a few tweeks, but not many. Zab: Another excellent point. Write down the method/colors you use. I do it all the time for color schemes so I can go back later and duplicate it if I have the need. This is one of the best posts I have read so far really great stuff these guys or gals are very talented thanks for sharing! Dunk: Glad you like it. I just painted an Ultramarine for my truescale comparison post and I tried to make sure I followed my own advice!